There are lots of different styles of Chain/Bracelet links. Here is a guide to the most common chains you are likely to find in our shop. This section will also explain the best chains for hanging pendants and charms from. If you have any other questions don’t be afraid to ask. is a popular choice for men because it uses a heavier and larger link. It is a simple design of flat, interlocking, similar links. Historically, the links were made rather large due to the fact that they were made with little machinery and were time consuming to make. However, with the advent of modern machinery, smaller and more feminine styles are now available. These chains are very popular for hanging pendants from as they are very strong. is a combination of three curb links followed by an oval cable link and has a repeating pattern. This is definitely a masculine chain in the larger and heavier varieties. The smaller and lighter variations are a nice choice for any chain wearer and not merely the exclusive choice of men. These chains are often seen with pendants hanging from them but are not as popular as a curb or belcher chain fro hanging items from them. similar to the trace, a belcher chain link is wider than its thickness. Generally the links are round, but the shape of the link can vary. A very popular chain when it comes to hanging pendants from them, they are made to withstand alot of weight. Box chain is a continuous linking of interconnected six-sided, three-dimensional, miniature boxes. It is a strong and sturdy chain that holds pendants and heavier charms well. is a family of chain characterized by small round silver balls, which form a continuous strand of beaded chain. Elongated spaces are sometimes added, as well as bar-shaped beads to offer a more glamorous appearance. They are available in single and multi-row formats. has interlocking oval links whose width is bisected by a bar. This chain is distinguished by the "dome" shaped links. 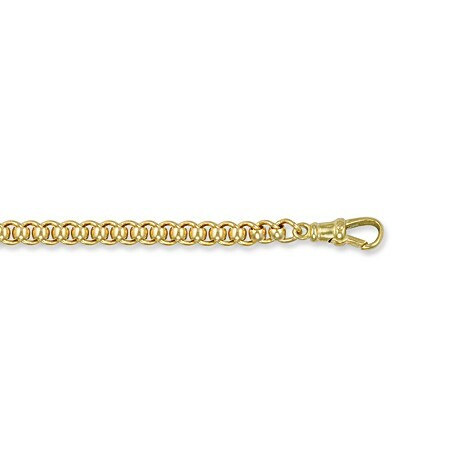 While the photo shows a flat style it is also available as a rounded chain composed of round links and a square chain. This is a style that was developed hundreds of years ago and is also known as the Birdcage or King's braid. A roller ball style link is made up from round shaped links which look to be separated by what look to be small balls. This also looks stunning and is also very reliable. Here at Pledge there are thousands of chains and bracelets available at low prices. We hope this guide has helped you choose which link is best designed for you.